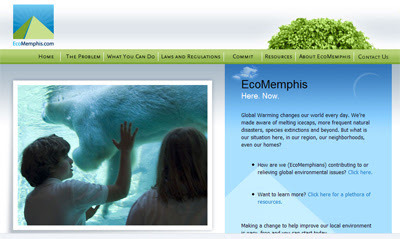 This summer we soft launched EcoMemphis.com on the Web, MySpace and Facebook. As there is no revenue associated with it, it’s been a slow rollout (as we still have to make a living). The increase of global concerns and actual news events to point at helps. Environmental concern is coming out of the long-tail and into the main stream hump. If $3.00 a gallon is what it takes to open eyes and get people talking about efficiencies, then I honestly wish for a huge tax on top of the that (in order to more quickly bring about the drastic modifications we need to be making). Necessity is the mother of invention. Even the United Nations is coming down hard about it.